moonstones unlike on other moonstones. The said moonstone has surfaced in the land of No. 160, Hathare Ela in Kaduruwela, Polonnaruwa belonging to Mr. Mahesh Kumarasiri. This is what he said: "the Water Supply Board were digging drains to lay a pipe line. the boy handling the bacho machine said that a slab of stone keeps surfacing. Then when I went closer and had a look, it appeared like a moonstone. Promptly I informed the police and Archaelogy. What they say is that this was the first time that a moonstone was found with Brahmi lettering. There are no animal figures. But there is a different type of carving on it. This came to surface after about four feet were dug". 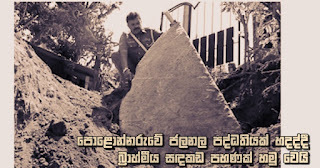 It is of special significance that this extraordinary moonstone which is approximately 5 feet in length and about 3 feet wide has links to the Vijithapura Fort of the Dutugemunu story detected by Archaelogists also because it stood close to a farmyard in Polonnaruwa. Whatever it is, we made inquiries regarding this from Director General of Archaelogy, Professor P.B. Mandawela. 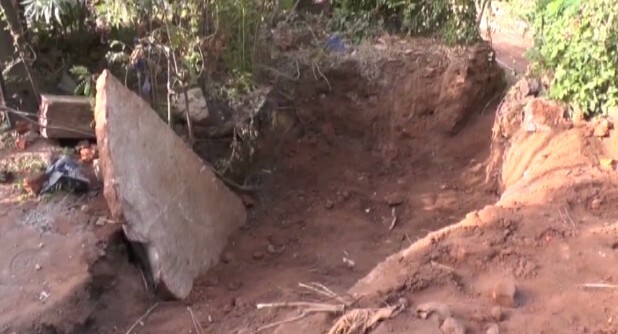 "It was when engaged in digging a drain to lay pipe-lines in that area with the use of a bacho machine along Kaduruwela, Hathara Ela in Polonnaruwa to supply drinking water that this moonstone has emerged, Archaelogy officers reported to me. It is only after inquiring from authorities and after their observations that a comment could be made".